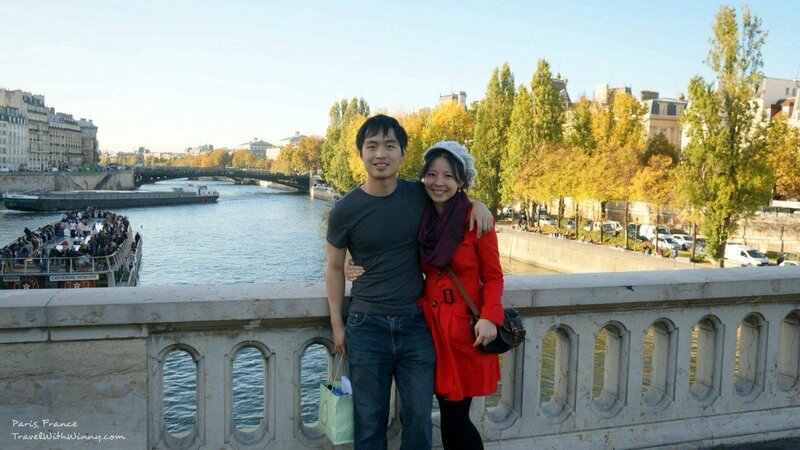 Paris has always been the city of romance, however on our second visit we decided to do something different. Some people enjoy visiting cemeteries around the world and I am one of them (York thought I was a bit strange). 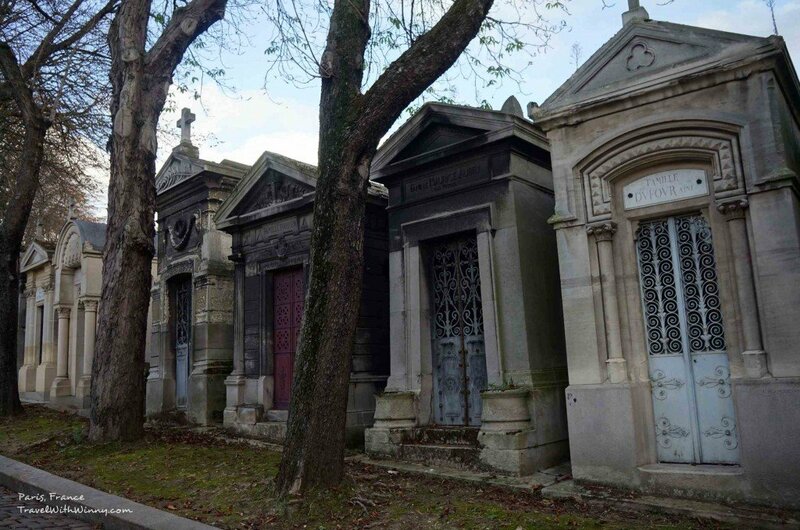 Père Lachaise Cemetery is the largest cemetery in the city of Paris (44 hectares or 110 acres) opened at 1804 . There are around 1 million people buried there to date. 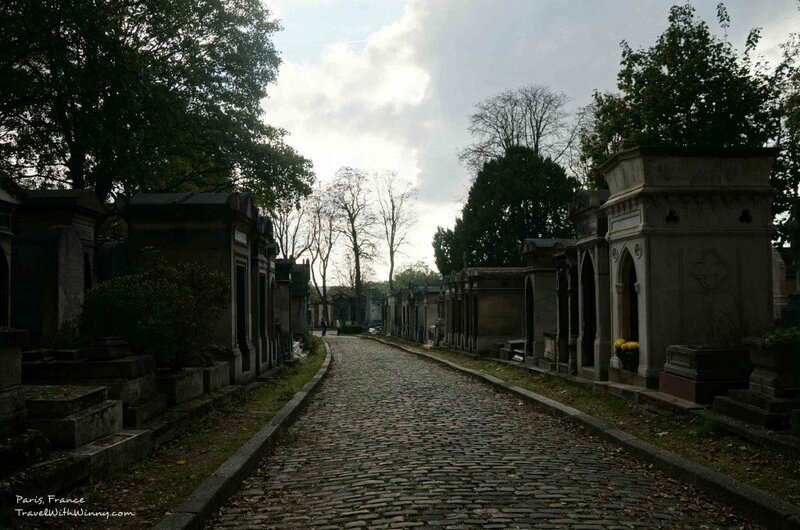 Père Lachaise Cemetery is on Boulevard de Ménilmontant with several stations to reach the place. The Paris Métro station Philippe Auguste on line 2 is next to the main entrance, while Père Lachaise station, on lines 2 and 3, is 500 meters away near a side entrance (this was where we got off). 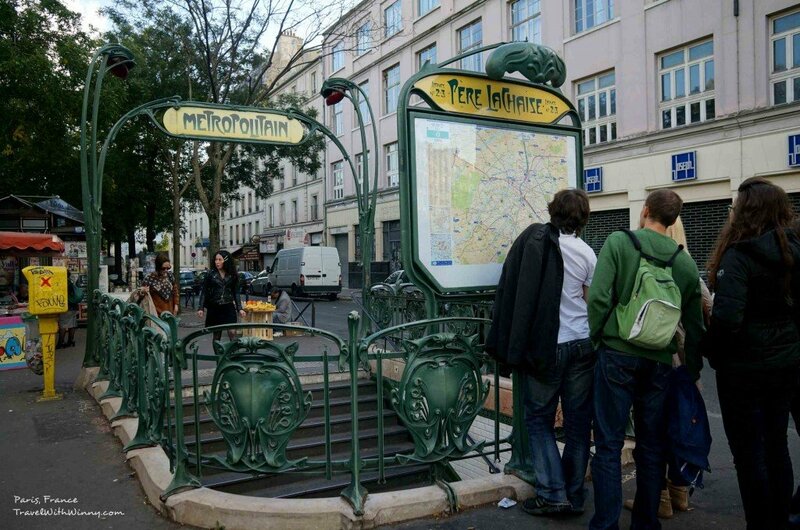 Although many tourists do prefer the Gambetta station on line 3, since it enables them to enter near the tomb of Oscar Wilde and then walk downhill to visit the rest of the cemetery. There are clear signs telling you which direction to go! 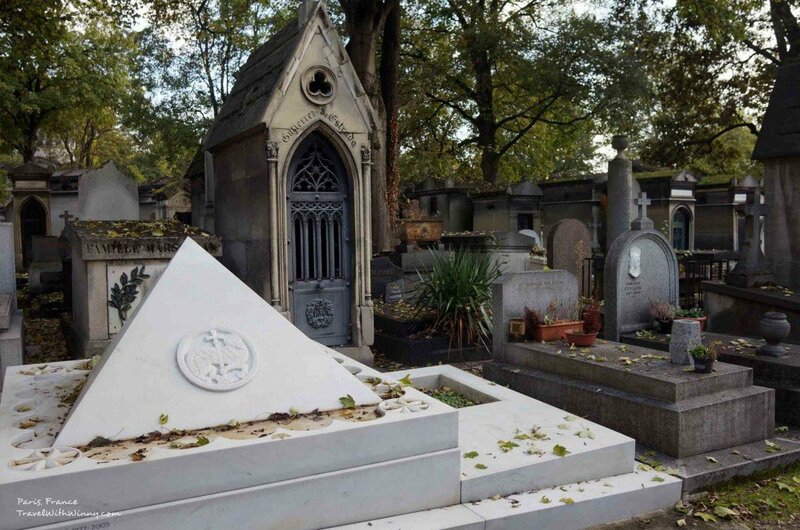 As you have guessed, many famous people were buried here (eg. Chopin, Jim Morrison, Oscar Wilde). You can buy or download a map of the famous graves to help find them. York and I didn’t do that, we just casually strolled around and admire the area. The grave sites range from simple headstone to monuments and mini chapels in the memories of famous person or family. We were surprised to see many tombs are around the size and shapes of a telephone booth, apparently it is just enough for a mourner to step inside and kneel to say a prayer. Chopin is the master of the solo piano, again, we didn’t find his grave too. The place is a lot more peaceful than we thought with couples making out on the chairs in front of the grave sites. I guess Paris is the city of romance after all. 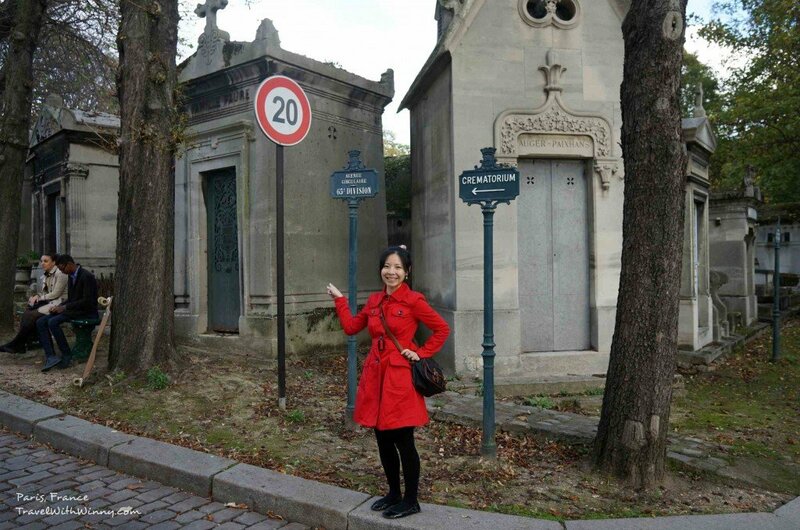 The cemetery actually felt like a small neighborhood (except they are for dead people), there were even street signs! 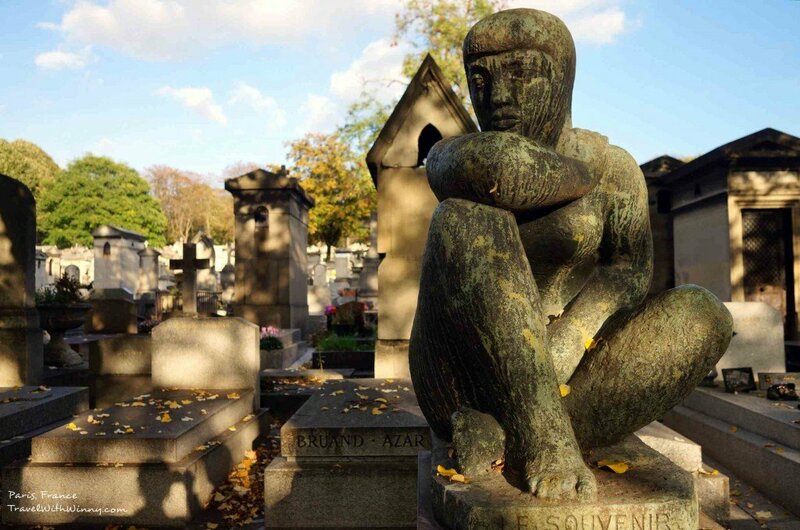 Many people want to be buried next to famous citizens, so there’s a wait-list for the grave. It is common to place another coffin after the body has decomposed, this allows the cemetery to combine the remains of multiple family members into the same grave. Grave sites with different shapes and sizes. I think an hour at this place is enough, there are some uphill in the area, so it will be good to wear comfortable shoes. 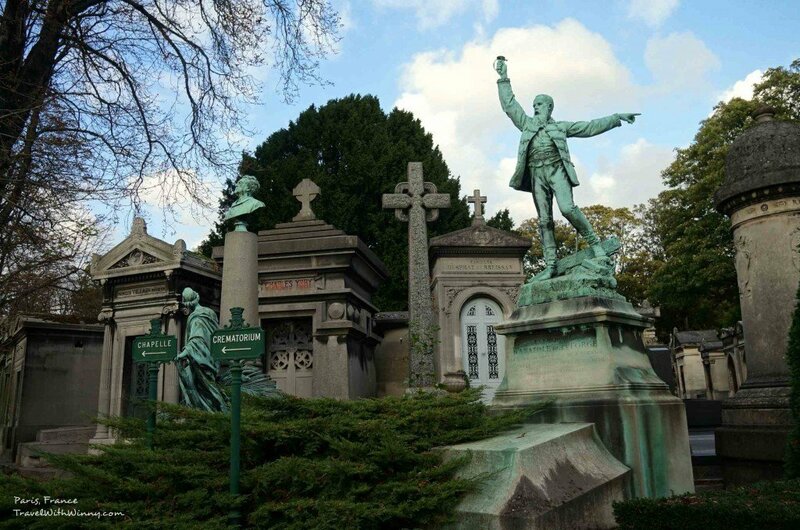 We have made a video at Père Lachaise Cemetery so have a virtual tour with us, it is definitely far away from creepy! The next destination we going to is the place I have died to go for years!!! The whole place was very peaceful for a nice afternoon stroll. 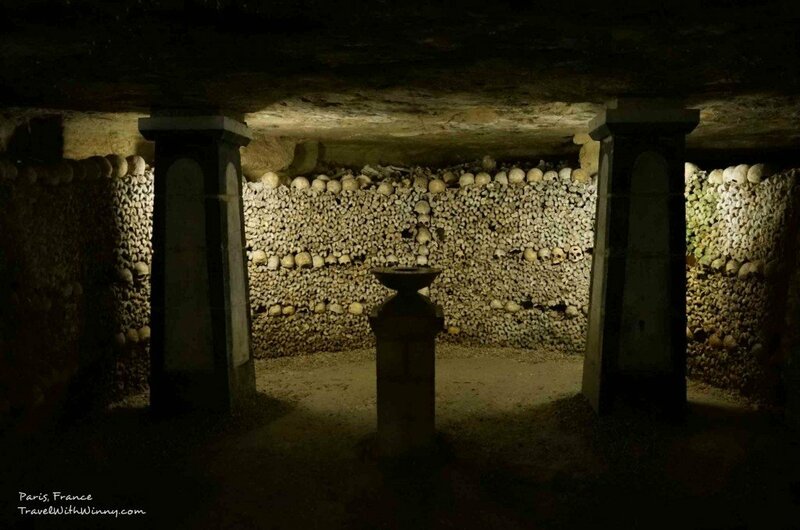 Ever since I saw Catacombs of Paris on National Geographic, I have always wanted to visit this place! Have you ever thought why are there no tall buildings in Paris? Have you ever wondered what the “The World’s Largest Grave” is like? The answers are all right here! These bones were from 1859. 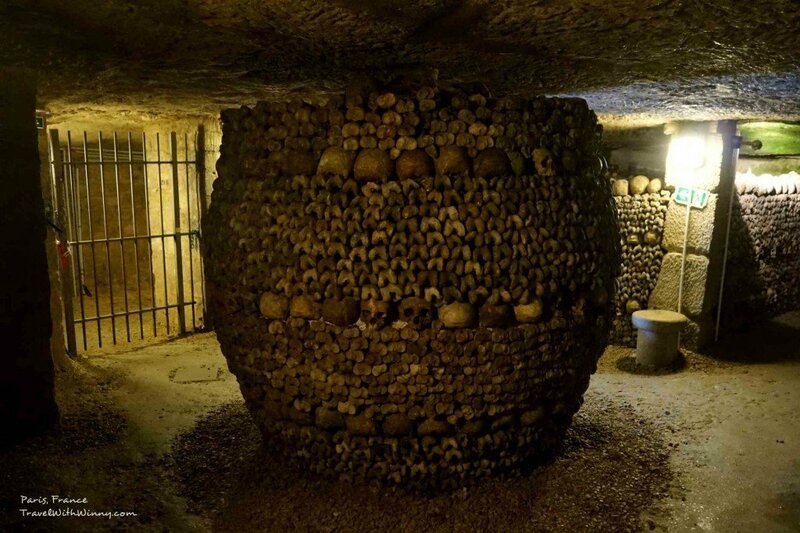 This ossuaries holds up to six million remains and takes up around 300 km of tunnels beneath Paris. 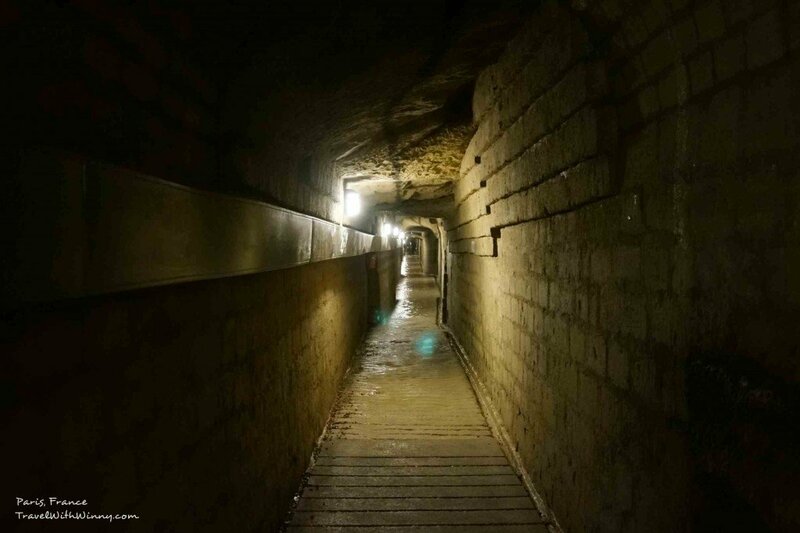 Even though the tunnels and galleries provided space to bury the dead, Paris can no longer build large foundations since the they right beneath Paris streets. Hence it is not safe to build tall buildings in the city area. 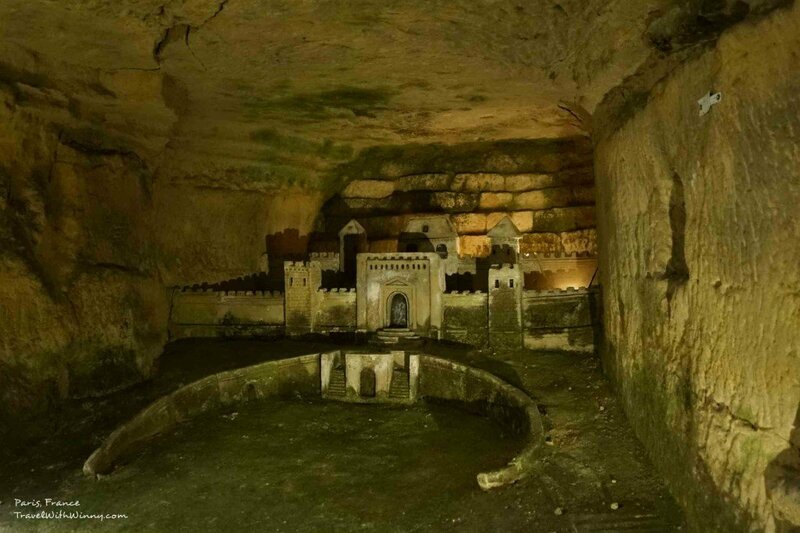 The Catacombs we entered only represented a small part of Paris’ underground tunnel system. There are also other tours that actually visits Paris’ sewage systems. The less romantic part of Paris. 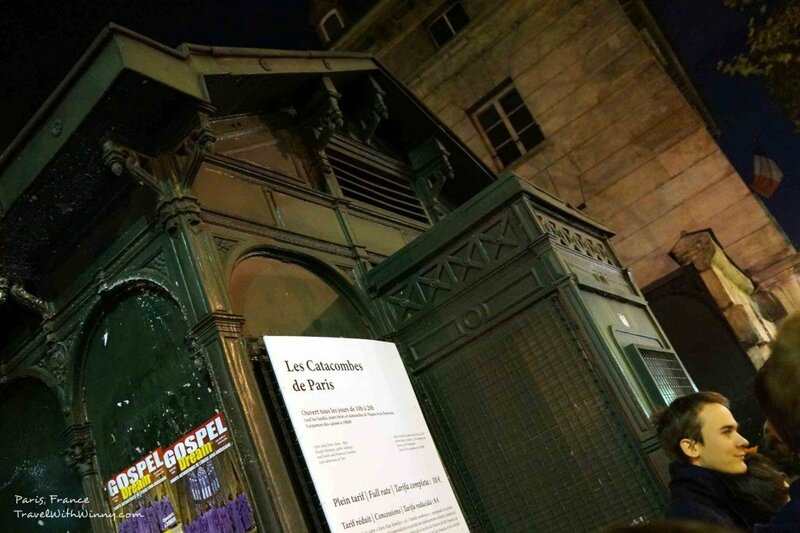 The entrance of the Catacombs was right outside of the metro station “Denfert-Rochereau”, it looked like a small building which can be easily missed if there weren’t a huge line of people waiting outside. The last entry was at 7pm and the place closes at 8pm. You can only have 200 people down there at any given time. There are no restrictions on how long you can stay down there, so the only way to get in is to wait for the previous party to come out. Some people waited for an hour and were only told by the guards that they have no hopes of getting in there by 7pm. 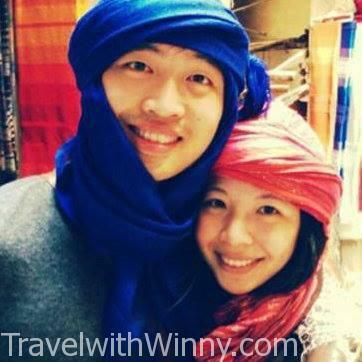 They should really develop a more tourist-friendly system. After 2 hours of wait, we were already hungry and cold, the anticipation of whether we can get in by the last entry time was not nice. Entrance of Catacombs opposite Denfert-Rochereau station. Luckily we were one of the last few people who got in! With the Under 26 Youth Card in hand, we were able to get slightly cheaper tickets. We then descended down a narrow spiral stone stairwell of 19 meters into the darkness with dim lights until we reached a room with many photographs and historical displays of this place. That’s when a couple behind us told us that I have left my Youth Card upstairs (why couldn’t they call out to us earlier, not waited for us to get all the way down…) I was about to give up my card but York ran up to get it. He was literally out of breath but I was still really impressed (Love you~)! Random sculptures 19 meters underground. 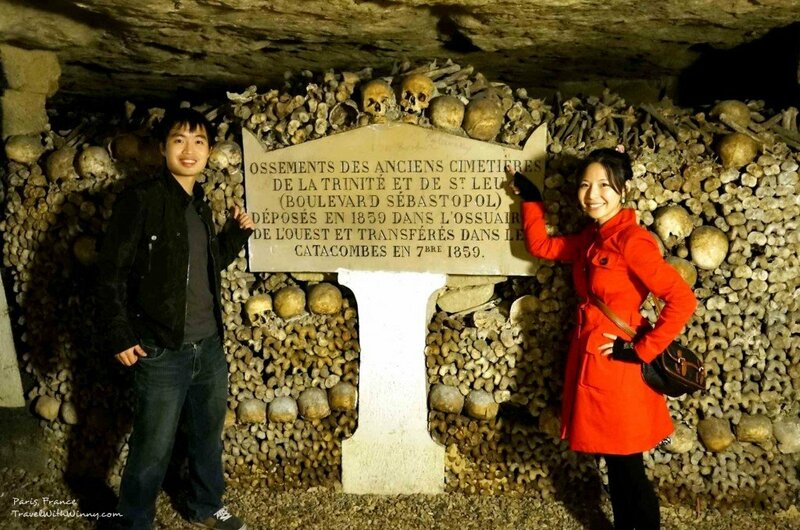 We had to walk 1.5km before reaching the ossuary. There were a lot of passage ways and sculptures created by the people who digged up this mine before the entrance that said Arrête! C’est ici l’empire de la Mort (‘Stop! Here lies the Empire of Death”). 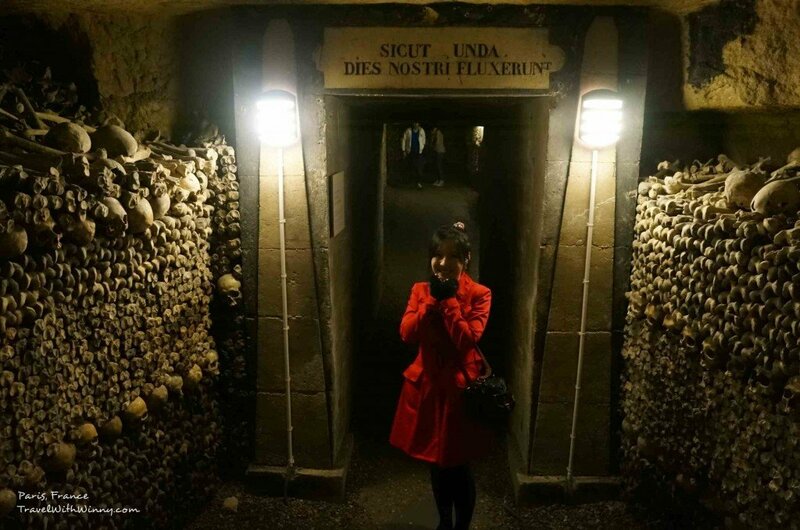 I gasped a little, with excitement and walked into a dark and damp passage with thousands of skulls and bones surrounding us. Apparently flash photography was not allowed, but I didn’t see the signs when I took these photos. The underground was a lot colder than I thought, even in summer the temperature under here would be around 57F/14C. Reminds of the movie “The Mummy” inside the tomb. Some of the arrangements were actually really cool and artistic. There was one wall with heart-shaped outline formed by the skulls and surrounded by tibia. The other one I liked was a centre pillar created by leg bones. We took a lot of photos in the Catacombs until we realized we were the last two people underneath the grounds (we only saw one old woman guarding the place reading a book on her stall..) It then felt a lot creepier. Towards the last few hundred meters, I stopped taking photos and “admire” the place since I was too scared to be locked down here at night. There were many rusty gates blocking chambers and passages to prevent people going into un-renovated part of the catacombs. The exit was 2 stations away from our original station with a gift shop opposite the exit door. The giant centre pillar created by leg bones.